The Bookshelf Diaries takes a peek into the reading life of writers, readers and book lovers. 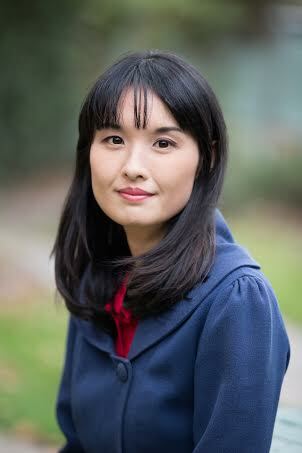 Today, Alice Pung talks books old and new, and where to read about race and class. I just finished reading Holidays on Ice by David Sedaris. I read it in one sitting. It is a book of short stories about holidays, mostly about Thanksgiving and Christmas. I love his humour and how he puts animals in his stories. In one of them – the last story – the animals in a farm are doing a Kris Kringle, and the calculating Cow picks the Turkey because she knows that she won’t have to buy the turkey a present as the turkey will get slaughtered for thanksgiving. He attributes all this malignant intent on gentle barnyard creatures and it’s just so funny! What was your favourite book as a teenager? As with most young adults, it depends on what stage of a teenager I was, since the years from 12-19 are enormous! At 13 I was reading Judy Blume, at 19 I was reading Jamaica Kincaid! But three books which stood out to me during my high school years were A Solitary Blue, by Cynthia Voight, and Dear Miffy by John Marsden. I didn’t know many young teenage boys, and these were portrayals of young men who were full of depth (or untapped depth). They seemed both intriguing and real. What book makes you mad? Half the Sky by Nicholas Kristof and Sheryl WuDunn. It was a real eye-opening book about the worldwide oppression of women. It was written with the keen eye of two investigative journalists, and made me realise how lucky I was to be born in Australia. I read it in almost one sitting, and then became an ambassador of Room to Read, an organisation which helps impoverished girls and young women achieve literacy. The other book that made me mad was Battle Hymn of the Tiger Mother by Amy Chua which prioritises success at all costs. What’s in your to-read pile? Family Matters by Rohinton Mistry, because I read his book A Fine Balance below, and he writes slowly and steadily like a turtle but with such wisdom and beauty. Also, The Noonday Demon: A History of Depression. This book takes an anthropological, scientific and cultural look at the illness – I like the holistic, historical approach because we often just read personal and medical accounts of depression. It was recommended to me by a good friend at the right time because some people close to me are suffering from this illness. What’s the best book you’ve read in the past year? New book: This House of Grief by Helen Garner, which she dedicated to the Supreme Court of Victoria. It made me understand what it must be like to be a witness to a murder trial, and how mind-numbing and tedious much of the evidence can be. Also, I understood that barristers were essentially storytellers and directors and performers: a more complex and incredibly creative role than simply knowing the law and being good at arguments. Old book: A Fine Balance by Rohinton Mistry. A story of four poor people in India from different backgrounds and castes who come together to share one year of their lives. It was just magical – so sensitive, funny and tragic without being sentimental or exoticised. Oprah recommends the best books! Is there a writer that has influenced your writing? Writing my first novel I was inspired by the literary greats of YA literature from my teenage-hood in the 1990s – John Marsden, Sonya Hartnett, Melina Marchetta. 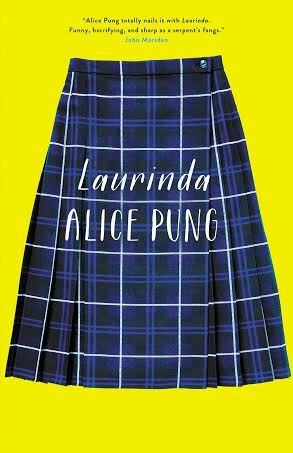 They wrote books that weren’t didactic, but spoke about class and race and the rural/urban divide in such a way that I don’t think they should be considered just YA books, but just great Australian literature. What do you read to feel inspired? Longform or Atlantic essays about entrenched inequality in the States. Because of the recession, now many stories are focused on people getting by, the value of humility and the worth of an individual that is not determined by their educational levels or class. I’ve always been interested in why there is not more writing about class in Australia (besides Christos Tsoilkis of course). Maybe the middle class here – who create and consume literature – are too comfortable, and prefer reading stories set in far-flung badlands (the Middle-East, Cambodia – hooray for me because I write about there!) But there are so many kids at risk in Australia whose stories we like to believe don’t exist. 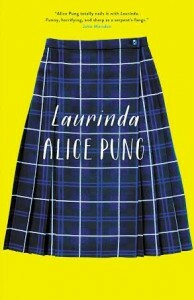 Alice Pung is the author of the bestselling Unpolished Gem and Her Father’s Daughter and the editor of the anthology Growing Up Asian in Australia. She is an ambassador and board member for the 100 Story Building, and works with various organisations as an advocate for literacy in disadvantaged communities and the education of young women. Laurinda is her first novel. This entry was posted in Arts, Books, Opinion and tagged the bookshelf diaries. Bookmark the permalink.